As part of my studies towards a Level 3 NVQ in IT, I need to write essays that include information that is useful to Noisy Little Monkey readers. When this happens, I post them. This article looks at the pros (not many) and cons (quite a few) of having a one page website. A website that only has one page is called a one page website, funnily enough! Choosing to have only one page on your website can have a significant effect on your search ranking and can create other limitations. If you’re thinking of creating a one page website, have a read of these 6 reasons and why I suggest you think again. With a website that is only one page you will usually make it so that the content is in separate chunks working down the page, as this is the best way to organise it. This limits how much information you can put in each section before the reader gets bored and stops reading. Another way to lay out the data would be to have it vertically scrolling across the screen like a carousel. While this may look nice, it is difficult to navigate if you have more than say 10 sections of information on your website. This is because big menus, with lots of choices, look confusing. It can be argued that a one page website is easy to design. As having only one page means you can spend all your time working on that one page, making it perfect. However if you get one bit of coding wrong it can be very hard to figure out what is wrong with it. This is because you have everything on one page and (depending on the complexity of your error and how hard it is to find) you will likely have to create another page to debug one piece of your code. Well actually, this depends on how you look at it. If you search for two different things you may appear for them both. But “only appearing once in a search engine” means that you can only appear once in the list of results for any of those searches that are relevant to your website. This means that your competitors have more of a chance if they have multiple potential landing pages. One way to get around this is to make sure you are actively using social networking sites, like Facebook, Twitter and Google+, in the most effective way you can. Doing this means that your social networking profile pages may appear in the search result as well, but it is far from ideal. As you probably have guessed you will only get Google Analytics result for one page! This makes it very difficult to tell what is bringing traffic to your website. On a large website you can see where pages have a higher bounce rate and how long visitors are spending on there, among other things. This will allow you to know what type of content to produce based on what matters to your visitors. 5) Good or bad for SEO? If you only want your website to target one keyword phrase, then you’re in luck. 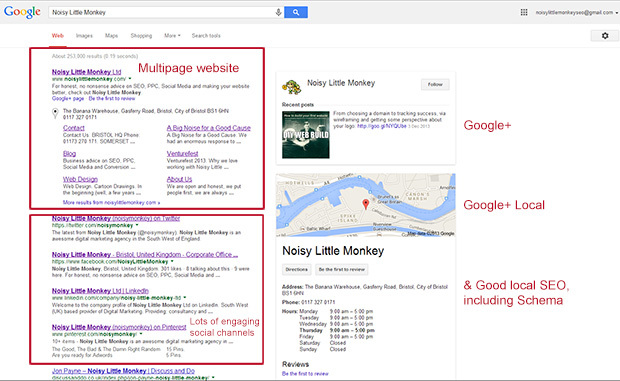 By having only one page, you can optimise all of your content for that one keyword phrase. If this is not the case, as with most businesses, then you might be in for a bit of a struggle. Google seems to like pages that are really efficient and load quickly. The more elements that are crammed onto one page the slower it is likely to load. Another similar problem is that you can only add one bit of Meta data and one H1 tag. This means that if you are trying to target two keyword phrases, then your site is unlikely to rank very highly for either of them. 1) The amount of information on the page. The more information, the more annoying it is going to be for the mobile or tablet user who has to scroll through all of that information. 2) When you try to load it on a mobile device it would probably take longer and would be time wasting for the user, especially if they only wanted something simple, like your contact details. If you want to know how to set up a website with more than one page have a look at “Start Up Websites – The Do It Yourself Guide” or if you want more advice, give us a call on 01173 270 171.